So What's with This Energy, Woo-Woo Stuff Anyway? It’s a question I often hear. Energy to the average person has to do with having enough of it to keep up with life. It means a great deal more to me. So there are a lot of people who can move that energy around. Again, Western medical people go, “No, that is all bunk.” Then one man spends much money and a number of years getting acupuncture recognized here and Western medicine goes, “Oh!” maybe there is something to that. Still millions of dollars are being spent to prove that it’s nonsense. There are many other types of energy practitioners in the world. Do we care that we are not recognized by Western medicine? Not a lot. There are always a few who would like to be paid by insurance, but for most of us, that just means someone who does not understand or believe in what we do would have the chance to tell us how to do it. Now I ask, does that make sense? 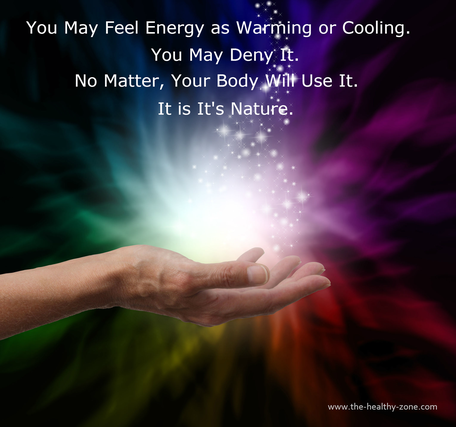 Many of you have benefited from practices that move energy. You may have joined a Yoga class or do Qigong or T’ai Chi. Maybe you have been to one of the folks who practice Reiki. Those are only a few. So, why is it that after the class you have more energy than before the class? Please, let me digress. Energy is also involved in our emotions and our responses to emotional stimuli. Earlier I said that in Western medicine, the electrical impulses are all about the brain. Well, actually they are about every cell in our body. Each cell holds memories, physical and emotional. The physical you may recognize as muscle memory that athletes use to reduce performance time. In a blog earlier this year, I spoke about emotional hangovers. Here I wish to talk about the physical hangovers. We all have them. They come from life situations, accidents, sports, surgeries, medical treatments and trauma of all sorts. Let me give you an example. You broke your leg. The surgeon puts in a pin. It’s healed, but the leg doesn’t feel right. You go to your doctor and he says that it healed perfectly. You know there is something wrong and you are not interested in the anxiety meds he wishes to prescribe. What to do? One answer is look on the energy side. Your body and the meridians in your leg have been violated. The flow is not right. Someone who routinely works with energy can correct that. Eastern medicine has been doing that for thousands of years. We are trained to do this. The not-so-subtle message here is that just because a group of people don’t have the tools to measure something and don’t have the belief system without those tools, does not mean that the thing does not exist. Gravity existed long before there was scientific proof. You are not crazy. There is a challenge with that perfectly healed leg. The surgeon did a great job, now follow your instincts and find someone to help you with the rest. A practitioner for more than 38 years, Linda Dulicai is a Certified Natural Health Professional and an Advanced Loomis Digestive Health Specialist educated in more than 25 modalities of wellness, including 7 types of energy techniques. She is CEO of The Healthy Zone.